This seven-bedroom enclave in the prestigious Paul’s Point area effortlessly invites several generations to share activities while also providing quiet corners for relaxation. 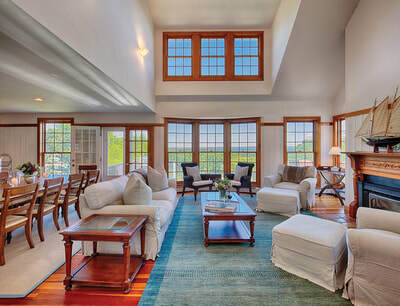 The pristine serenity of an English park surrounds this main house and guest house where the gently sloping land opens to a remarkable view of Vineyard Sound, the Elizabeth Islands and Woods Hole beyond. Perched at the top of the meticulously maintained grounds is the five-bedroom main house with a pea stone driveway leading to a stone path surrounded by stone walls and perennials. 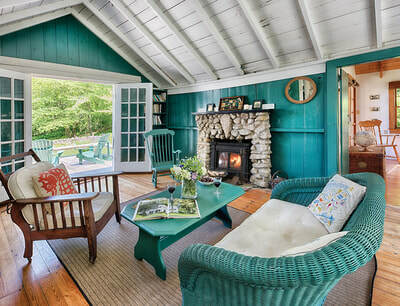 The home’s easygoing charm is reflected in the living room with a vaulted ceiling, built-in bookshelves and wood burning fireplace with access to a deck stretching the length of the house. This outdoor entertaining space takes advantage of the incredible vistas. Two floors of windows allow light to pour in and reveal the commanding water view. There is an office alcove at the back of the living room. 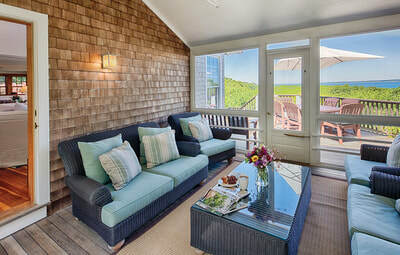 To the left is the dining room and kitchen that both share the views. Beyond is a butler’s pantry, hallway with a full bath and guest bedroom. 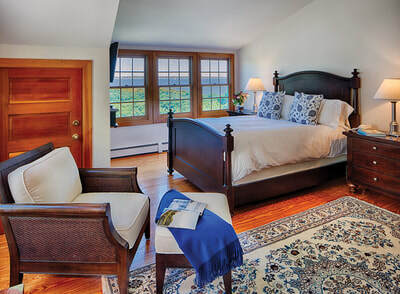 On the second floor, the master bedroom and bath also enjoy the water view. 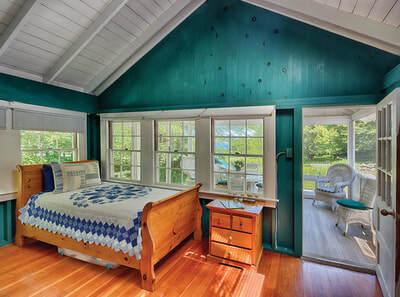 To the right of the living room is a screen porch that welcomes cross breezes and leads to a guest suite with bedroom and bathroom. The second floor is now used as a sitting room but could be an additional bedroom. The lower level houses another private bedroom and bathroom plus the laundry area, utility room and storage area. 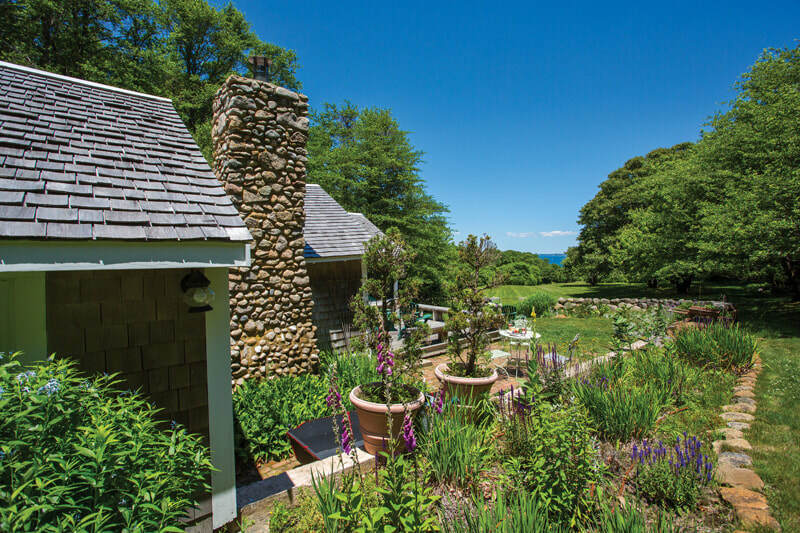 Sumptuously landscaped grounds offer garden rooms designed with stone steps, mature shrubs and perennial gardens that add to the tranquility of this sanctuary. A sweet wooden walkway leads through the forested section and across a burbling stream. Steps lead down to the private, sandy beach where nearly 200 feet of shoreline invite swimming, boating or just relaxing. 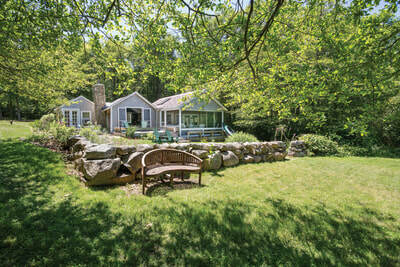 A charming 1920s camp is located a short walk through the hollow lends seclusion for family and friends. Used as a two-bedroom guest cottage, the home has a living room with fireplace, modest kitchen, screen porch, full bath and laundry room as well as an outdoor shower and deck. This home had previously been approved by the West Tisbury Conservation Commission for demolition and replacement with an 1,100 square-foot structure, screened porch and decking. Approved plans are available.